Oaktron by MISCO is a complete line of high performance, ready-to-ship transducers for a wide variety of applications including high fidelity, musical instrument, aerospace, paging, and many more. From lightweight to heavy duty, from compact to massive, from elegantly simple to highly specialized designs for unique and demanding applications, there is an Oaktron loudspeaker perfectly suited for your needs. In today's world, OEM customers need more than just a speaker manufacturer. MISCO is a nearly 70-year-old company with a solid record of reliability, stability, and exemplary customer service. We offer full "soup to nuts" OEM audio solutions, including design, prototyping, and production of amplifiers, digital signal processors, and enclosures, as well as speakers. MISCO's skillful integration of the entire system – speakers, amplifiers, DSP, and cabinets – yields audio performance that is greater than the sum of the parts. Sourcing audio system elements separately waste time and money, and usually produces poor results. Our unified approach is the best way to get optimum sound quality, fit & finish, and lowest net cost every time. 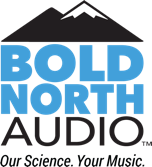 Bold North Audio products aspire to be the most accurate, true-to-life, and revealing audio transducers and systems available. Bold North Audio's world-class performance is rooted in fundamental scientific research, careful materials selection, precision manufacturing, and, most of all, love of music. MISCO's engineers have harnessed cutting-edge Klippel vibrational analysis science to reveal the keys to superior audio performance. While relying heavily on objective science to lead product design, MISCO is not slaves to it; understanding that most of all speakers need to tell the musical truth. MISCO engineers, musicians, and recording studio veterans are the final judges of when a design is worthy of the Bold North Audio logo. MISCO is a leader in developing and providing high-performance audio amplifiers for OEM applications. With innovative designs, MISCO pioneered in digital audio, DSP, in single and multi-channel solutions. Each amplifier is built and fully tested by trained technicians. MISCO ensures true IEC compliant specifications. MISCO Digital Amplifiers are small, class-D amplifiers engineered for use for specific audio applications. Designed for use with the application in mind, these amplifiers provide solutions for a huge variety speaker configurations. An obvious benefit of the small size design is that they fit almost anywhere. In addition, they offer an unprecedented feature set.